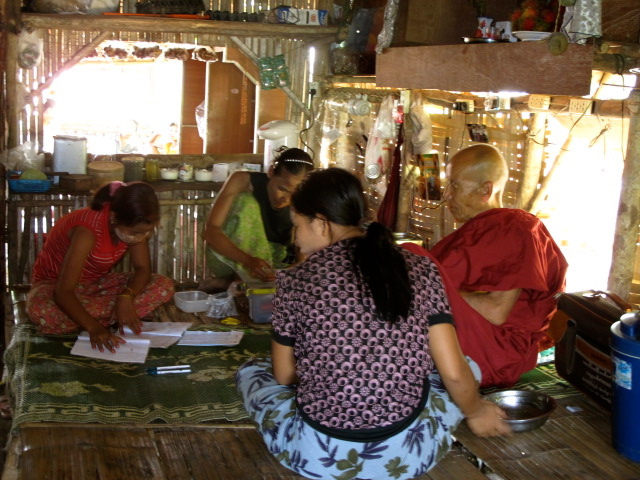 Eyes to Burma has had an incredibly busy few months in the lead-up to the rainy season. 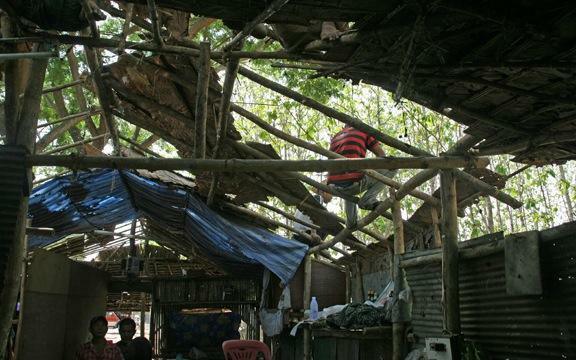 Most houses have been in a shocking state, and in need of much repair if they are to get through the monsoons. Clinic runs to Mae Tao are nearly always a daily event and our water tanks are constantly in need of refills. Fred continues to supply the community with work tools such as sickle knives, headlamps and batteries to enable them to work more effectively and safely in the evenings. We have also been working on getting a vitamin program up and running, with a particular focus on pregnant women, infants and the elderly. This includes providing a weekly supply of fruit that is in season – a luxury which they would otherwise not prioritize in their daily struggle to provide food for their families. In the meantime, we have to start thinking about the distribution of mosquito nets, as malaria and dengue fever have broken out in the camps close by. Out here in the dump, there is an incredibly strong sense of community spirit. Yet the prevailing conditions and insufficient income of all residents means that it can be hard for residents to offer help to each other beyond the bare necessities. We have had a few particularly sad cases of abandoned mothers and widows whose houses have been in a terrible state. 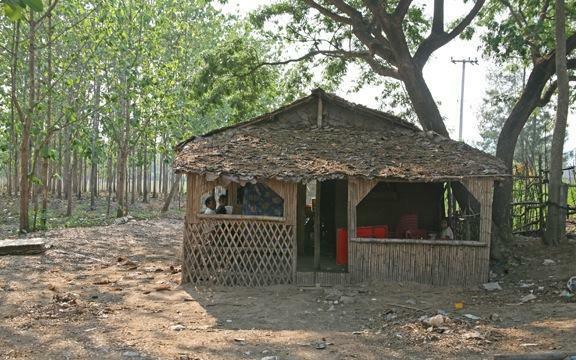 Fred was invited to a Christening of a newborn, for example, whose parents were yet to find roofing materials for their dilapidated ‘shelter’ of bamboo sticks and twine. Sitting on a floor without even a mat, and surrounded in garbage and flies, Fred couldn’t help but admire how resilient this young couple was. Indeed, despite their circumstances, there is a great sense of pride among community members and rarely do they ask for help. You can see from this photo just how stark the young couple’s situation really was. 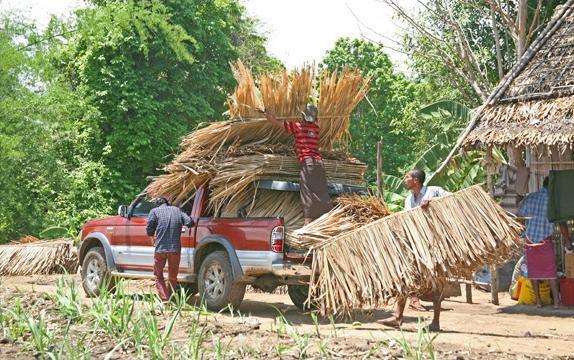 Witnessing firsthand the dire situation of this young family, Fred set about gathering their neighbors’ help in exchange for distributing roofing materials to the wider community. 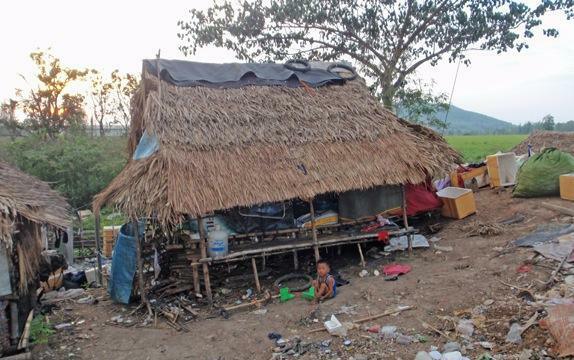 This involved daily trips out to isolated villages close to Mae Sot, where community residents helped Fred find the best price for appropriate materials. From the photos below you can see how the men, women and children came together to help out. 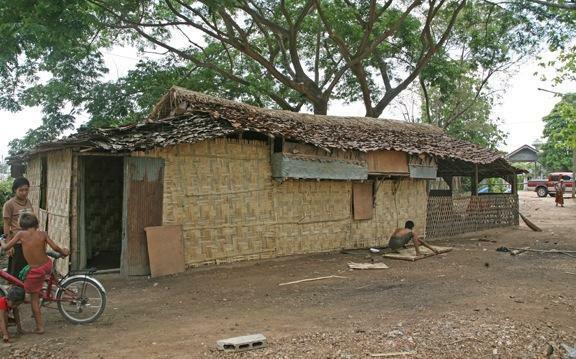 We buy roofing materials in local villages as it not only keeps the price down, but it means we keep the local economies thriving. 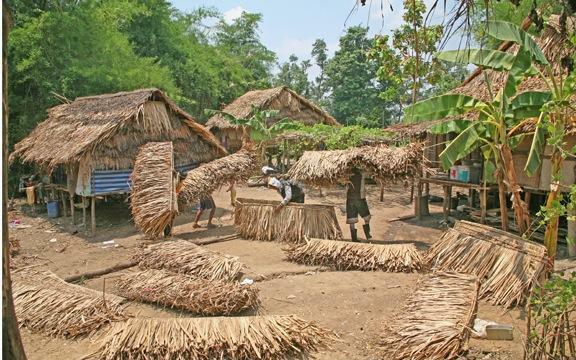 One of the villagers making the thatch for the roofs. 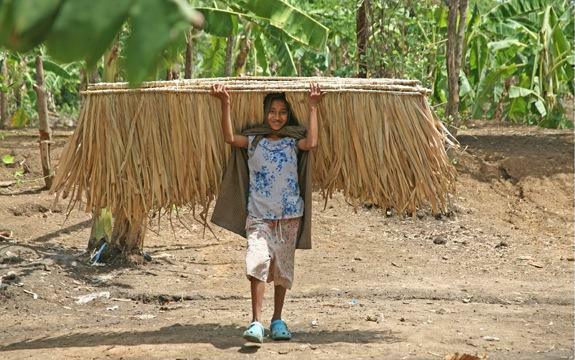 After the prices for the roofing has been agreed, everyone gets involved to help carry the materials to the truck. 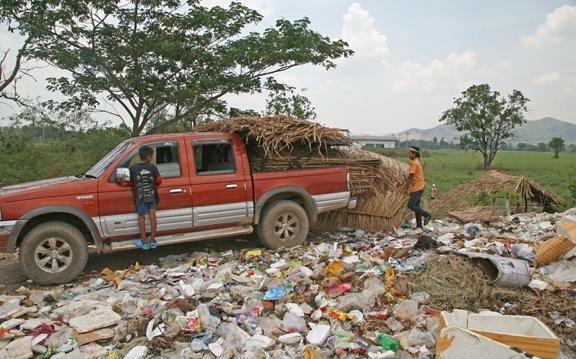 It took over six trips back and forth to the village to get the materials required for the community in the garbage dump. Getting it all into the truck. On return to the dump we unload the materials to get the building process underway. 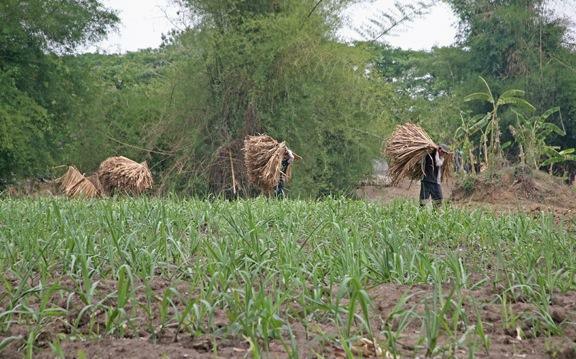 Within days, nearly everyone’s roof had been upgraded tremendously, and residents were beginning to feel more confident about getting through the rainy season. A safe, dry place can make all the difference: It is the first step to preventing disease and allowing some kind of comfort in their otherwise terribly difficult lives. One of the completed roofing projects in Area Two. Another successfully completed roof ready for the upcoming monsoons. Fred has formed a lot of incredible relationships with members of the community, but one young woman has always held a special place for him. Fred was aware of how tough Danna’s life has been, as she was involved in a number of abusive relationships. In late April, Fred had driven over to Area Two to check the water tanks and some of the roofs for the upcoming rainy season. 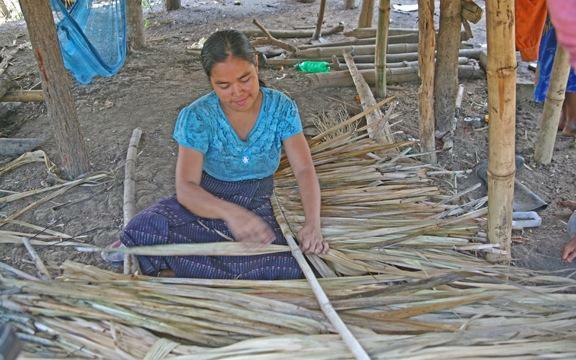 Danna took Fred to her new place that she’d been trying to build with old pieces of bamboo she’d collected from the dump. With absolutely no money, and no assistance from the rest of the community, she asked Fred to help her with the somewhat precarious-looking hut. Fred had recently been considering renting an unused building (on private land within the dump) to set up as a combination shop, clinic and women’s community centre that he hoped would become self-sustaining. Unexpectedly, the building became available for purchase, and Fred jumped at this opportunity. Given Danna’s situation, Fred spoke with her about taking over the community center project, which would provide her with a house and the independence to support herself. Danna was very excited and happily accepted Fred’s offer. It took about a week to fix the building up, as it was very run down. After fixing the roofing and walls and cleaning the interior, Danna and (now) her sister had a new home and an upcoming business adventure to share. Fred also asked Danna to take care of the two orphans who had arrived in the dump earlier in the year, as they were distant relatives of hers. The purchase of our new building has been one of the most positive projects for the community. You can see here just how much work it needed before Danna was ready to call it home. In the midst of fixing the roof of the new shop. A brand new wall and roof for the community center to keep the rain out. 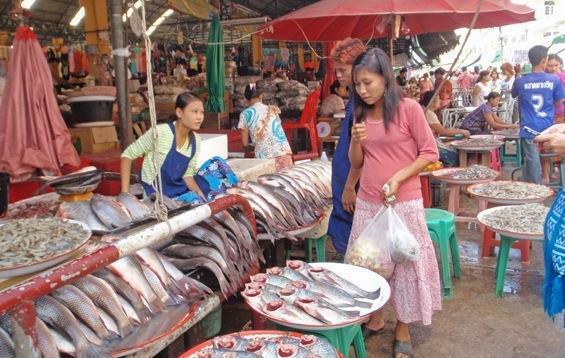 Taking her shopping in the Mae Sot market, Fred was totally amazed at how savvy Danna was. Within a few days they had gone from selling only sweets and snacks to meat and vegetables, and later curries and other Burmese specialties. This project has been hugely successful. One of the questions that has often come up during our presentations is how to get people off the dump. Not only do we have four people off the dump now, but we have provided them with an opportunity to learn new skills and ultimately a sense of empowerment and ownership. Dana busy bargaining at the market in Mae Sot. She is getting a fast track education on running a business and learning very quickly. It is also amazing to see how quickly the shop has become a community center. Having electricity, there is entertainment through television and music, as well as a place for people to charge their phones. 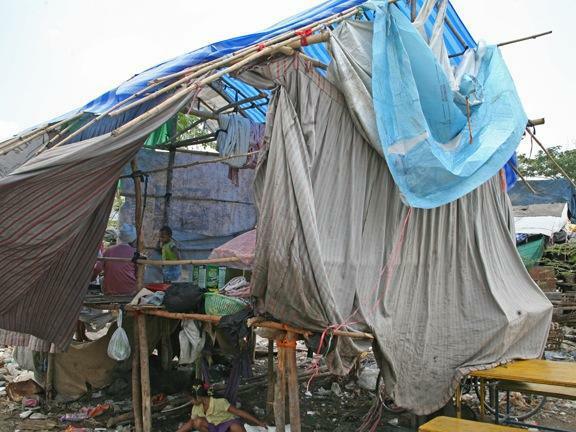 Over the last month, we would come to the dump and find the shop overcrowded with mostly women and children. While the mothers sit and chat over tea, the children play together, singing along to the music and watching their favorite movie stars on the screen. It is nice to see the shop as a clean and dry place where everyone is smiling and laughing together outside of the garbage. Everything was starting to run really smoothly, and the biggest drama for us was the rising costs of water tank refills and having to take Danna to the market every day for food since everything was selling so quickly in the shop. 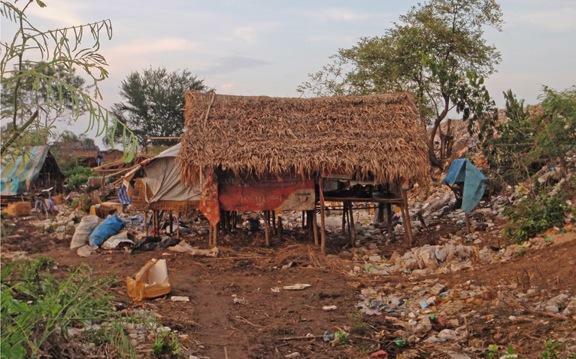 Coming into the dump one day, an air of despondency hung thick over everyone in the community. As we walked into the shop, no one stood up to greet us and the young children who usually ran up to give me high fives sat listlessly in the chairs in front of the television screen. Danna was more than visibly upset, and through our interpreter Tom Tom, we discovered that many of the people had been told by the new manager at the recycling centre that they may be forced to leave the area. While some people thought that he was simply trying to intimidate and place fear within the community, we were incredibly worried and upset, particularly as we had just completed finishing the roofing for the rainy season. Fred has met with the new manager now on several occasions, and we have finally reached some common ground. Whilst the language difficulties have made it particularly frustrating, we have managed to negotiate areas within the dump to which families are allowed to move. On a more positive note, intent on making sure his workers are fit and healthy, the manager has promised to supply clean water and electricity to these designated zones within the next few months. He has also mentioned the possibility of us moving the shop/community center to a cleaner area, so that we can take the responsibility of providing food for the dump residents who work at the recycling factory (which is on-site). It’s important to remain optimistic, but we are wary of the many empty promises that have been made in the past. By the end of the week everyone was given a deadline, and under the rain residents began building anew their lives along a road close to Area Two. With the transition in management at the recycling centre, no one is able to work, so the shop has become incredibly important in ensuring that everyone had a daily supply of food. Danna is taking on a powerful role in the community, keeping us informed that everyone is being fed and has a dry place to stay at night. This photograph shows how destructive the move was on the community. 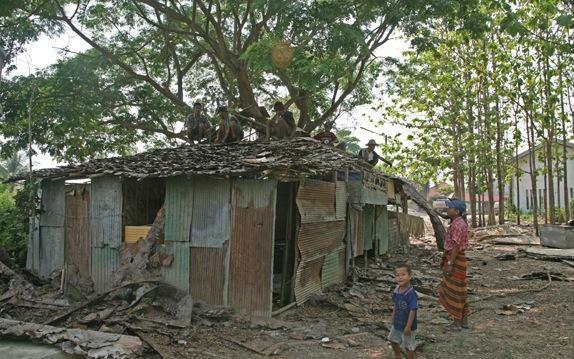 Approximately thirty-five houses were forced to relocate two miles away. It was a huge mission to move the tank to the shop and everyone got involved. Thankfully the water truck came during this crucial period. Fortunately we were able to negotiate some of the recycling center’s trucks for the big move. A small truck being unloaded at the new location. One of makeshift shelters prepared to get through the rainy nights whilst everyone was moving. During this difficult period, the recycling factory has been closed while they reorganized the area. We have helped as much as we could to provide people with food and shelter. Many families have had to resort to burning rubber for metal to sell due to the sheer desperation of the situation. Some of the new home coming together in the rain. A brief respite from the rain. Song in front of her new home which is increasingly coming together every day. We’ve been really lucky and made some new friends from Bangkok. This is Sophie’s second visit to the dump and Eyes to Burma would like to make a particular mention of the generous donations she has made. She and her husband are in the food business there and make monthly trips to Mae Sot. In addition to donation of a cot and baby paraphernalia for Danna’s new baby, this weekend they brought with them frozen chicken and spring rolls for the shop to cook and hand out to everyone. Danna was confused at first as to what to do with this food, but Tom Tom explained that she needed to fry them like KFC. All enjoyed their delicious crispy treats and went to bed happy and content after a difficult week. It was pretty obvious that no one had any income and therefore had no way of providing food for their families. Danna went out of her way to make sure everyone was eating by cooking large quantities of warm and nourishing curries and rice. Kids being fed at the community center during the upheaval. With June now upon us, every day is slowed down by the constant sheets of rain that greet us here in Mae Sot. 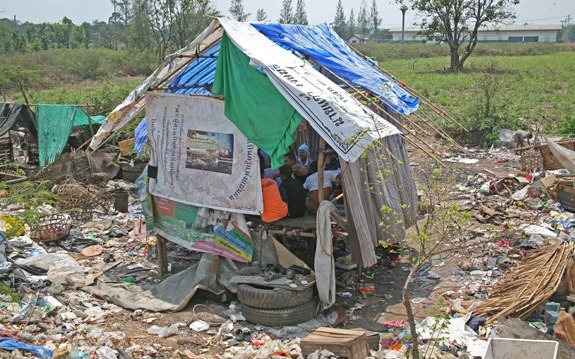 The dump is increasingly turning into a quagmire of sludge and garbage, and it is hard for anyone to stay dry or clean. The recycling centre is supposed to open again this week, so hopefully we can soon return to some kind of normalcy. In the meantime, every day brings a new family in need of some kind of help, whether it be roofing materials, food, or a clinic run. Everyone crammed into the shop while they had no where to go home to. Fred wants to thank everyone for their continued support of Eyes to Burma. As you can see, each and every day is different and every contribution, no matter its size, goes so far to improve the lives of this community. 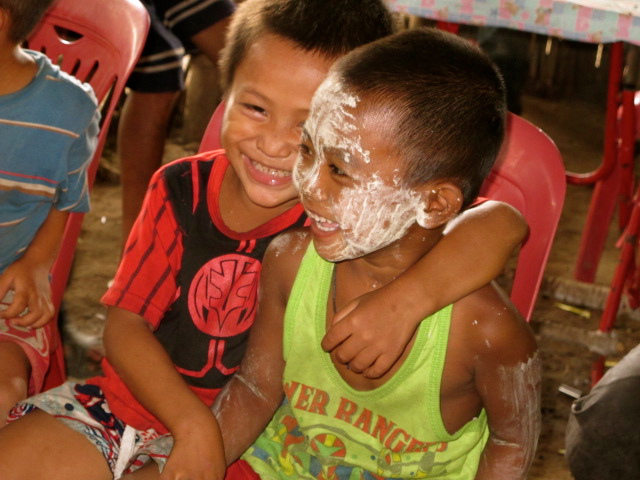 There is so much we haven’t said here, but we hope this report gives you some insight into both Fred’s amazing work here in Mae Sot and the incredible hardships faced by a population that has no political or legal rights. We also hope it has given you a moment to reflect on just how fortunate we are and how much we take for granted in our busy lives. This entry was posted in Fred's Letters, Mae Sot Volunteers. Bookmark the permalink. Fred, You are amazing! Thank you for all you are doing for your beloved community there. I am touched by your and their determination, hard work and undying energy. Blessings to all of you.